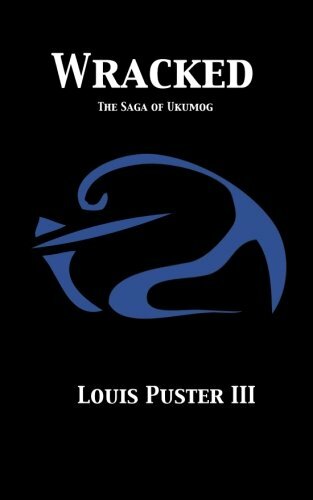 Wracked: Book 1 of the Saga of Ukumog is a dark fantasy novel written by the American author Louis Puster III. Wrack awakes in a shallow, mossy grave with no memory of how he got there or who he is. Shards of his former life return in brief flashes of color, as Wrack traverses a bleak world, where seemingly immortal creatures with godlike power—the Doomed—wage war on each other and the living alike. A power awakens within him, and with it, a dark hunger. Wrack and his unexpected companions—the beautiful warrior Brin and clever Avar—each seek something different: answers, vengeance, stories. Their disparate goals are more entwined than they ever imagined, and the three soon find their fates may be inextricably bound through prophecy. "Wracked - The Saga of Ukumog Book 1 by Louis Puster III is the story of Wrack who finds himself in a mossy grave. He has no clue about how he got there. Lying there, pieces of his past life flash through his monochromatic life. He sees larger-than-life creatures there and suddenly he senses a power and a hunger awakening inside him. Wrack has some unexpected companions, Avar and Brin, on this journey. All of them are looking for something different but their goals lie entwined together. The book is an amazing tale of vengeance and dark stories and will excite readers, especially those who like dark fantasy. The author narrates the story in the present where the person has lost his memory and to know about this readers are taken to his past. The flashbacks in this book create another plot which the author has blended well with the main plot. The mystery angle, the intrigue and the suspense that comes with it make it an gripping tale. The plot has been written and developed well, along with some powerful characters. The clever plot keeps the readers engaged in the book till the very end.